"Here we are living in paradise, living in luxury..."
A park full of old geezers doing karaoke with portable machines in the open air at sundown. Street stalls galore selling food and alcohol. Drunken boisterous groups of middle-aged men in the street. On a Tuesday. 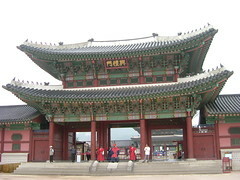 The hugely impressive great city gates (photos to come). Branches of Dunkin' Donuts everywhere. Team Korea football merchandise everywhere. 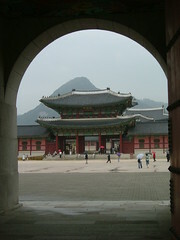 The Gyeongbokgung palace - more impressiveness. The amazing amount of stuff for sale at Namdaemun market, including a load of stuff that was obviously taken off the U.S. military base. Seeing people stretched out on park benches in the early evening, taking naps. A bunch of middle-aged Korean guys in military uniform putting up banners outside Seoul Station (I found out later from a news report that they were veterans protesting against the missile test by the North). The Cheonggyechoen river at night - it used to be really polluted, but after a huge clean-up operation is now a nice spot in the heart of the city, full of courting couples at night. It made me think about the approach in Japan - most rivers there are artificial concrete channels, just like the Cheongyecheon, but it at least in Seoul they make an effort to make it look nice. All in all, a nice trip. Next time I go, it'll be for longer, and I'll make more of an effort to explore the rest of the country. 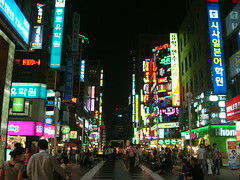 From what I've seen of Korea's natural features, it's just far too beautiful to just visit once. Oh yes, enjoy my photos. A twentynothing student in Leeds. Â© Jim Moore, 2005-2006. All rights reserved.